“Our spring in Palestine is born shackled to a hospital bed.” Rafeef Ziadah, Palestinian poet. On May 8, close to 2,000 Palestinian prisoners entered the fourth week of a hunger strike, a mass campaign of peaceful resistance, to demand the most basic rights: an immediate termination of the administrative detention policy and the excessive use of solitary confinement, humane living conditions, family visits, and reasonable access to educational materials. Two prisoners, Tha’ir Halahleh and Bilal Diab, have now refused food for more than 70 days. According to Physicians for Human Rights – Israel, both are at immediate risk of death. On May 7, Israel’s High Court denied their appeals against “administrative detention,” under which people can be held indefinitely without charge or trial. The presiding judge, Eliakim Rubenstein, acknowledged flaws in the investigations into both the Tha’ir and Bilal cases, casting doubt on information and sources used by the Israeli security service to obtain the administrative detention order. Even so, the High Court judges refused to release either prisoner, or even to reduce their period of detention. Instead they upheld the arbitrary power of the military commander who signed the orders. 2) Britain’s largest supermarket boycotts companies exporting produce from illegal Israeli settlements. 3) United Methodists endorse boycott. In Tampa, Florida, the General Conference of the United Methodist Church voted to call for boycott of all Israeli companies “operating in the occupied Palestinian territories.” This constitutes the majority of Israeli corporations. In addition, the conference expressed strong support for the “Kairos Palestine” statement from Palestinian Christians, and called “for an end to military occupation and human rights violations through nonviolent actions,” actions which include boycott, divestment and sanctions (BDS). These measures provide the basis for further action by the Church to hold Israel accountable for its colonial and apartheid regime. 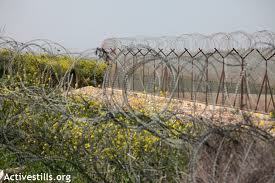 4) Stop the Wall raided by Israeli military. At 1:30am on May 8, ten armored jeeps of the Israeli Occupation Forces surrounded and raided the offices of Stop the Wall in Ramallah, West Bank. The Israeli military stole 2 laptops, 3 hard drives and 10 memory cards containing files and photos as well as archive material. This is yet another attack on Palestinian civil society and their struggle against the repression, land confiscation and ethnic cleansing policies of Israel. For almost ten years Stop the Wall has been promoting civil resistance and advocacy campaigns against the Wall and in defense of Palestinian rights to self-determination. This is not the first Israeli attack on Stop the Wall. In September 2009, the organization’s youth coordinator was arrested, and then in December, coordinator Jamal Juma’ was arrested. Israeli authorities were unable to bring any charges against either of them. After an international campaign, both were freed. A few months later the Israeli military initiated an extensive raid at Stop the Wall. Jamal Juma`comments: “It is not surprising that the Israeli authorities have chosen to escalate their repression on the same day that the Israeli High Court rejected the appeals of Palestinian hunger strikers Bilal Diab and Tha’ir Halahleh, effectively condemning them to death. “Our spring in Palestine is born shackled to a hospital bed.” Rafeef Ziadah.